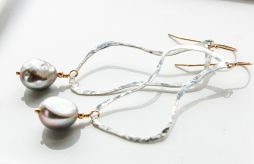 Organic shape hoops with Freshwater Pearls, women’s earrings, mixed metal. Organic shape hoop earrings with Grey freshwater Pearls, June birthstone gifts. Unique, art nouveau style, super long earrings. 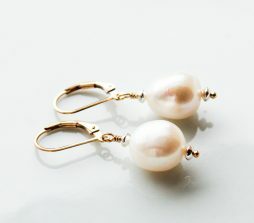 Earrings are fully hand forged, organic hoop links made of sterling silver, hammered wire, gold filled ear-wires, Baroque pearls. 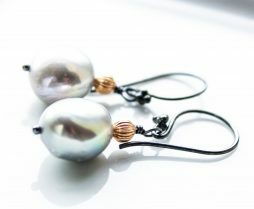 Pearls are 11-12 mm big, great metallic silver coating. Natural, freshwater pearls, organic shape. Earrings are super long and have unique shape and design. Total length is 3″. Genuine brown deerskin leather, finished with two freshwater ivory color pearls, attached with gold filled pins. Leather is 30″ long. Pearls are 11-12 mm big. 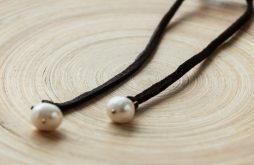 Necklace could be worn in a different ways, lightly tie the two ends and leave pearls to dangle, or make a small bow and wear it like choker. Pearls have been called the 'teardrops of the moon'. Some believe that pearls were formed by the passage of angels through the clouds of heaven. Over time, the pearl has become the symbol of purity and innocence and it is often sewn into bridal gowns, or worn as jewelry by the bride. 70’s style jewelry. White Pearls and chain tassel earrings in sterling silver. 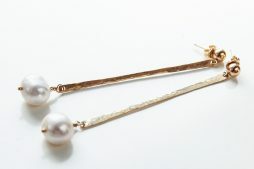 White Freshwater pearls and sterling silver tassel 70’s style earrings. 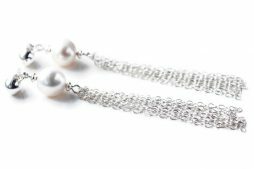 Genuine white pearls and sterling silver – June birthstone gift. Wedding jewelry, bridal gift. Bridesmaids jewelry. Earrings are handmade with 8-9 mm big freshwater white pearls, sterling silver handmade tassels, ball studs and sterling silver beads. 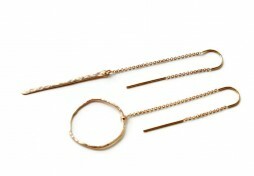 The total length comes to 8 cm or 3 1/4″. 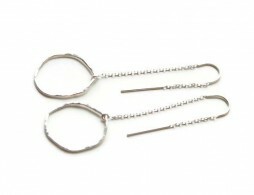 Long sterling silver earrings, threaders with U-top and organic circles. Jewelry trends 2016. 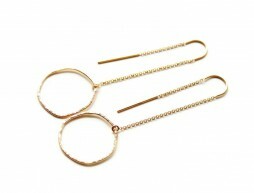 Earrings are 70mm long with hammered, organic shape links at the ends.